Follow these proper instructions for taking care of your flat or raised panel wood kitchen cabinet doors and they will last a longtime. There are a few things you need to do in order to preserve the beautiful finish on any set of oak, cherry, mahogany or maple cupboard doors. In this article, you will learn what the best method is for cleaning your doors, where to get them refinished and how to care for them on a daily basis. 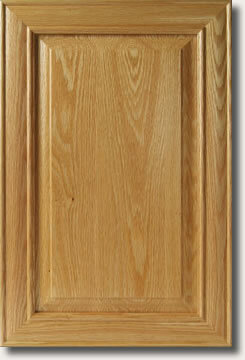 The quality of the original finish is going to greatly affect the age in which the doors will last. In any case, follow these instructions for taking care of the wood cupboard doors and they will stay beautiful for a long time. Water Moisture is Your Greatest Enemy! In areas around the dishwasher, sink and the refrigerator, water deposits getting on the cabinet doors may be a daily occurrence. If you have custom appliance door panels installed on the face of the dishwasher or refrigerator, you are at an even greater risk of moisture damage. When caring for these areas, always wipe the wood doors off with a dry cloth every time you get water from the dispenser in the refrigerator and after loading the dishwasher. It would also be a good idea to watch for steam build-up around the dishwasher area as well. When finished washing dishes in the sink, you must wipe the cabinets off every time. You should NEVER allow a damp rag to touch the cabinet doors while hanging on a dish cloth rack hanger. DO NOT drape them over the doors to dry out or install hooks that allow the cloths to touch the cupboard doors. When you order your wood kitchen cabinet doors always ask for a care kit. Companies like Kraft Made Cabinets generally have a wood repair kit equipped with wood filler and a permanent marker that matches the door color. These are great for fixing small spots where the finish has begun to wear off. If you ever encounter major damage to your wood kitchen cabinet doors, taking them to a local furniture refinishing company is my first suggestion unless you can order new ones from the original cabinet door suppliers. 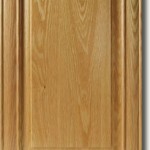 You may also call a few local manufactures and ask if they do wood cabinet door repairs. Usually if they don’t, they know someone who can. Antique furniture finishers are really good at matching original coloration’s of real wood stains, clear coats and top coats. While caring for your doors, the best way to clean them is to just use a damp cloth and wipe them off well. Never scrub in one area with great pressure. Always gently work on a difficult spot such as dried on food or hardened liquids from things like coffee spills. NEVER allow deposits of food or beverages to stay on the wood cabinet doors in the kitchen for extended periods of time. DO NOT ever scrub them with a Scotch Brite pads either. 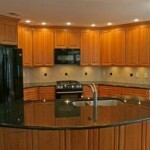 If you have handles or knobs, be certain to clean these areas in great detail. 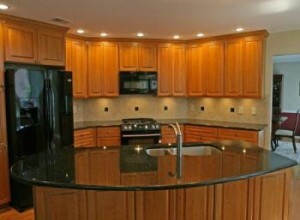 This is where the most dirt, oil, food, and drink deposits build-up because you are always touching the real wood kitchen cabinet doors in this area. If you don’t have handles or knobs be sure to clean the places where your hands open the cupboard doors. We never recommend spraying your doors with any type of furniture wax. The epoxy coated finish on the real wood doors is plenty durable to protect the wood underneath. You may use a brand name furniture cleaner that is made for wood finishes though. I would only caution you to use them once per month or so. As the video below demonstrates, it’s Ok to use a citrus based cleaner to remove grim and grease build-up. You just want to do this once-in-a-great-while. The use of products such as Windex or Formula 409 should be avoided at all costs. These cleaning supplies have chemicals in them that will break down the durability of the clear top coat on the cabinet doors. Little by little the chemicals remove minute layers of the top coat and over time will get completely worn off in places. If you have cabinet doors with stained glass inserts or regular glass be careful to not get any of the Windex on the finish of the wood doors. The best method to use is apply the cleanser to the rag rather than spraying it directly on the glass. This will keep the liquid from working in behind the stiles and rails of your cupboard doors. As long as you maintain a weekly cleaning schedule for your kitchen doors they will stay in great shape. 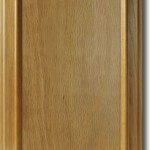 Caring for them regularly is the key to your wood cabinet door maintenance success. Above all DO NOT let water damage that could have been avoided be your story. 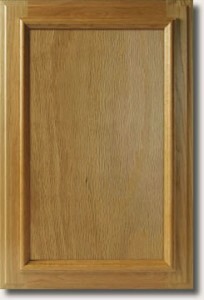 Set aside the proper time needed to take good care of your wood cabinet doors. This entry was posted in Wood. Bookmark the permalink.